Famous Pop Art was displayed in Suzi Nassif’s recent exhibition at Mina Brasserie in Four Seasons Hotel in DIFC Dubai. The exhibition was entitled, Visages. It was organized on 18th of March 2019. This is one pop art painting done by Suzi Nassif in one of her recent pop artworks. Actually, it is a beautiful acrylic painting on canvas which presents the portrait of Marlene Dietrich. This piece of pop art painting was really well received by pop art lovers and in fact, it remains one of the most famous pop art paintings done by Suzi which is regarded highly and admired by thousands of art lovers. The painting depicts the beauty and personality of Marlene Dietrich. Marlene Marene is a lady who reinvented her work life during those times when the voice of women in the society did not matter much but she was very resilient in her resolve to make an impact in the society back then. She soon got recognition for her work on the 27th, 1901, in Berlin where she was feted for her humanitarian and social efforts. She was a lover of freedom and she could easily change her personality. Indeed she did a great job ensuring she helped dissidents to escape from Germany to the USA at a time when there was repression in her country. 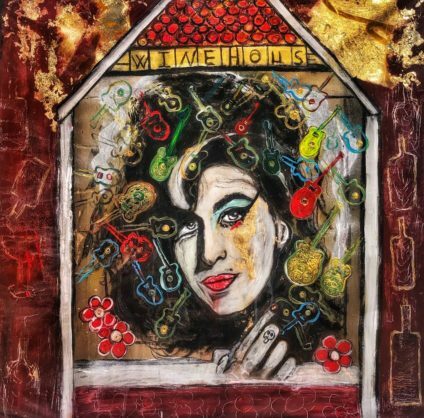 Another impressive pop art painting that Suzi Nassif is acclaimed for is that of Winehouse. This one is also an acrylic painting on canvas. Here in this pop art painting, Suzi has used various colors to describe music icon, Amy Winehouse. Guitars of different colors can be seen on the portrait of Winehouse as well the red lipstick on the lips of the artist. The English music icon died back in 2011 and although she is dead her music still leaves on and now she makes one of the subjects of Suzi’s pop art work pieces, quite amazing! This is yet another famous pop art painting created by Suzi Nassif. It is an acrylic/gold/silver leaf painting on canvas. Suzi has used various types of dominant colors in this pop art painting and Lina can be seen in the painting carrying an apple that’s painted red. The apple is seen having some sort of worm in it which leaves so many questions to be asked by pundits. For those who understand art, they can be able to read from the portrait and draw many conclusions from the piece of artwork. 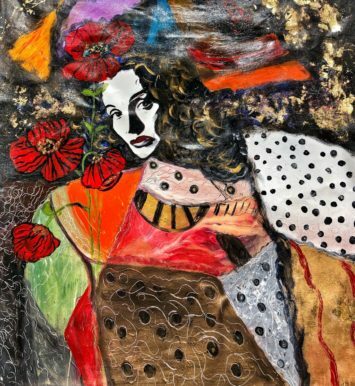 For more about the other works by Suzi Nassif, a visit to her official website page will suffice.